I didn’t understand the theme until I put in the last letter (the N in 3d LENITY). Grokking it sooner probably would have helped my dismal time but c’est la vie. WRINKLE IN TIME is our theme (70a, [With “A,” classic science fantasy novel, and a feature of the theme answers]). (See also 27a AVA [DuVernay who directed a 2018 adaptation of 70-Across]). I was thinking this meant that we were looking for the letters TIME, but scrambled. Or else we would be looking for units of time (seconds, minutes, etc.) modified somehow. Neither of those turned out to be the case. What it actually is is that Mr. Trudeau found phrases that have the four-letter string TIME and then “wrinkled” that string with the use of a block, either making the letters go up or down as needed. 21a [*Nostalgic sort] with 22a SENT (I) MENTALIST, dipping down to get the I. 33a [*Having two or more legislative representatives] with 35a MULTI (M) EMBER, going down for the M.
48a [*Container ships’ business] with 51a MARITI (M) E TRADE, going up for the M this time. 87a [*Lighthearted chamber orchestra pieces] with 89a DIVERT (I) MENTOS, down. 104a [*Device for measuring X-rays] with 106a QUANT (I) METER, up. 119a [*”Exactly! You get me!”] with 122a “THAT’S WHAT (I) MEAN!”, up. Whew! This had to have been a bear to construct what with the sheer amount of theme material and with some of the letters triple-checked. 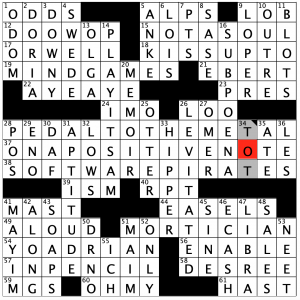 And it’s very elegant to have the second part of each themer be a legitimate crossword entry in its own right. I’ve never heard the terms MULTI-MEMBER or QUANTIMETER, but maybe I suspect those are just gaps in my knowledge base. With a theme this big and tricky there are inevitably going to be some compromises to be had. These can be found in the likes of dupes “THAT’S WHAT” and TRUE THAT as well as NO IRON and NOS, uncommon words LENITY, POMMELED, OLEATE, and OTOMI, and the heavy crossing of proper names in the SE (KINER, PETER I, EVARISTE, ERNST, TURNER, SEGAR, and TERI GARR, with SUHARTO crossing KESHA and KERI nearby for good measure). That whole section was rough for me, but I managed to bull my way through. But there are a lot of great entries, too, like RIPOSTES, DJANGO, BIO LAB, the aforementioned TERI GARR (answer to last week’s contest crossword, btw), “POOR ME” countered by “I’M FINE,” EUROSTAR, OIL TANKS, DANCE MOVE, ANT TRAPS, WAR DEBT (though that was hard to parse), LUMMOX and FANFIC. With a tricky theme like that and the difficulties inherent in the construction as well as the fun fill, I’m happy to overlook some of those trouble spots in the grid. 3.8 stars. Now, the fourth row hits you with UGH SSN NYE UAR, not so entertaining, and assorted other short and medium fill was blah. SETUPS beside the weird SWOOP UP (to me, [Quickly grab] would be SCOOP UP) duplicates UP too close together. Other crunchy entries: NUTS ABOUT, HOT MESS, SNUFFLEUPAGUS, the seismic BIG ONE, and BONE SPUR (I would rather have the fake ones than real ones). Did poetry throw you off on 58a. [Renaissance artist who’s famous for his “Coronation of the Virgin”], FRA FILIPPO LIPPI? There’s a Robert Browning poem called “Fra Lippo Lippi,” and our class read (the much shorter) “My Last Duchess” instead of the long “F.L.L.” so I don’t think I learned that Lippo was short for Filippo. The 59d. [Trim option] clue for FUR stumped me, since I was thinking of car interiors and not fancy parkas. I did NOT solve this Downs Only; not confident enough yet to do a Saturday puzzle like that. Or maybe I am just scared! Or maybe I am most fearful of how long it will take, and being in accounting, this time of year is a little hectic. I may try one soon, though: my understanding is this is one of the best ways to improve solving skills for these tournaments. Maybe next Saturday! At any rate, a great puzzle this week. A great triple 15 stack in the middle is certainly the highlight here with three great entries, including ON A POSITIVE NOTE and SOFTWARE PIRATES. Lots of great stuff in the grid as well: 18A [Act sycophantically with] KISS UP TO might be one of the better clue/entry combos in the grid. Can you tell I found a lot to like? A solid 4.7 stars from me. 5A [High points on a European itinerary] ALPS – One of these days I will be on the side of one of these mountains watching the Tour de France. It’s a bucket list thing! 19A [Psychological attempts at one-upmanship] MIND GAMES – Makes me think of the show Brain Games that has tons of puzzles for the viewer to try an solve. 28A [Part of a flooring metaphor] PEDAL TO THE METAL – I spelled METAL with a D (MEDAL!) when I filled this in. Speaking of “MIND GAMES,” I think mine played a trick on me while entering this! As you can see in the grid image, that was where my only error was! 51A [“Six Feet Under” occupation] MORTICIAN – I have never seen this show, but most of us know at least what it was about. 54A [#80 on AFI’s 100 Years… 100 Movie Quotes] YO, ADRIAN! – Another great entry! Rocky is still a classic. 1D [Tony winner Leslie __ Jr.] ODOM – He does not appear in the Chicago version of Hamilton that I have to go see at some point, but he is in some Nationwide commercials! 5D [Huber of tennis] ANKE – This is tough if you don’t know tennis. She was a great player in the 90s, but I know tennis and this is in my sweet spot. Is she crossword famous, because there is no other way to clue this, is there? 14D [Start of #28 on AFI’s 100 Years… 100 Movie Quotes] PLAY IT, SAM – The story is that the quote is “Play it again, Sam,” but I don’t think that is how it plays out in the movie. I think this entry is more accurate. Time to watch Casablanca again! 27D [Seven-week period in Judaism that begins during Passover] OMER – I don’t know this term in this way. I believe it is used as a unit of measurement in the Bible, though. 46D [Bitcoin, e.g.] E-CASH – For your reference, as of Saturday morning a one bitcoin is worth $5,000.00. I think it was close to $20,000.00 a couple of years ago. Sorry if you didn’t cash out when the price was high! I will stop there. There’s basketball to watch today! Almost under 10 minutes! I still think I have only solved one or two of these in under 10 minutes. I was rolling on this one, and, as usual, bogged down in a corner, in this case the upper right. I don’t remember what I had incorrect in the grid, but something slowed me down and caused some issues. Stan (“Lester”) still knows how to make a puzzle. A solid 4.6 stars for this one. 10A [__ 6, 1932 (when Sousa left us)] MARCH – This is a clever clue. For some reason I wrote APRIL at first. Duh! 19A [Food processor’s product] CAN – Oh, THAT kind of processor! This may be the best clue in the puzzle. 27A [What Tim Cook got from Duke] M.B.A. – He didn’t get a PhD, because that was my first guess! 39A [Andrew’s apostle brother] ST. PETER – I knew Peter was Andrew’s brother, but I keep forgetting in puzzles the ST can appear before apostles’s names. So you can imagine my confusion until I remembered that key piece of information! 54A [Where ”Swiss Family Robinson” was written] BERNE – Makes sense! Berne IS in Switzerland, right? Fun fact: There is a Berne, Indiana, which I actually have travelled through on my way to the Bike MS in Oxford, OH, that I did a few years ago. I should do that again this year! 3D [It’s south of Uganda] RWANDA – How is your African geography? 9D [Sunset Ride and Rodeo Jr.] STETSONS – There are different kinds?? 14D [Person responsible for 9 Down] HATMAKER – This made no sense until I learned, and I mean LEARNED, the tidbit of info from 9D! 31D [Only single-syllable state capital] PIERRE – Is it, really? 35D [What Lazarus called Miss Liberty] COLOSSUS – The title of the poem on that statue is The New Colossus. Have you been to the Statue of Liberty? I haven’t been out there in 20 years. 38D [Trying inductions] BAPTISMS – A “baptism by fire” is usually said in these cases. Tough clue, but I still like it. 53D [Home of an Asian Universal Studios] OSAKA – This is a bucket list item for me: a trip to Japan. I think I would love it, although the language would be a challenge. Do you know they intermingle THREE alphabets?? Great puzzle, and I could go on, but it’s the weekend! Everyone enjoy their Saturday activities! I’m probably the wrong person to be reviewing this puzzle. My sports star knowledge is quite limited. THEME: Athletes whose retired numbers match the clue number for which they are the answer. 15A [He wore this clue’s number, which the Celtics retired] TOM HEINSOHN. 24A [He wore this clue’s number, which the Cardinals retired] WHITEY HERZOG. 53A [He wore this clue’s number, which the Dodgers retired] DON DRYSDALE. WHITEY HERZOG vaguely rings a bell for me (so does DON DRYSDALE, although I initially had the name DAN in DON‘s place). Although this puzzle was by no means in my wheelhouse, names were fairly crossed for the most part. RIO LOBO was tough to see crossing DON. I suppose FRIEDAN might be a cause of a Natick for some as well. Admirable that Jason was able to ensure the grid maintained those numbers for the theme answers- that can get tricky toying around with fill and black square placement. I’m assuming that’s why the theme answers have an unusual placement with the first two being against the west wall and the last two against the east (rather than staggered). I SAY A is a partial I could’ve done without, but what else fits the I??Y? pattern that was needed as the entry crosses two themers? This entry was posted in Daily Puzzles and tagged Brian E. Paquin, Jason Mueller, Lester Ruff, Ned White, Ross Trudeau. Bookmark the permalink. Choosing FLIM over FLAM denied me Mr. Happy Pencil at first, also got caught by the PLEA/POPE trap for Innocent. Nice workout for a Saturday morning. LAT – Derek, it wasn’t your mind playing games with you. It was me transposing letters with you. My only error was a T in what should have been PEDAL. PIERRE might be one syllable in French, but it’s two in English. I thought the clue for BAPTISMS in the Stumper didn’t work. A baptism by fire is indeed a trying introduction, but you can’t say that of a baptism alone. Yes you can, says Random House Unabridged. FWIW, I called 4 radio stations in Pierre, and asked for the proper pronunciation of their city. Two were quite cordial and said they get that question all the time. One was a bit snarky, and one was downright rude. All four pronounced it as one syllable. I am originally from (eastern) Iowa, and we always pronounced it as two. It’s a good thing to be educated, even at this advanced age! 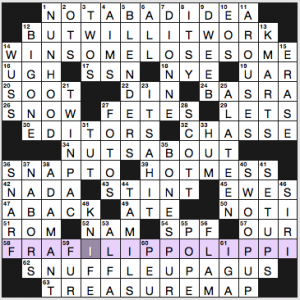 Thanks to a fabulous art history professor, I didn’t struggle with FRAFILIPPOLIPPI when I detected the emerging pattern in the name. Even though that was over two decades ago. I can appreciate the challenge, though, with the hard to spell SNUFFLEUPAGUS below and not-so-common knowledge Jim NABORS and funny-sounding (to me) FLAM. The puzzle would have benefitted from an entire overhaul of that bottom third. Ditto. I had a blank where the Sesame Street character intersected the supermarket chain, which as far as I know doesn’t exist in this part of the country. Grumble. But I did recognize Jim Nabors, even if I never watched that show. WSJ: Yeah having NO IRON crossing NOS right below UM NO tricked me up in that SW corner. And worse to my mind, there was TRUE THAT crossing THAT’S WHAT. LAT – Strange grid resulting in three mini-puzzles. Top third solid after a while, with very little to help out with the second third. Just a couple short downs, and some mental gymnastics finally suggested SOFTWAREPIRATES. Then ATF at 30D slowed things down. ONAPOSITIVENOTE and PEDALTOTHEMETAL finally emerged, forcing DAF at 30D. WTF is that, Dep’t of the Air Force? Does that make DA and DN Dep’t of the Army and Navy? Then the bottom third almost revealed itself. Loved YO ADRIAN. All in all, though, I loved it, and rated it 4.5. 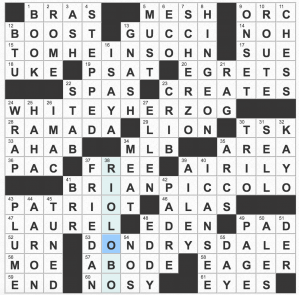 NYT: An otherwise good puzzle ruined by the bottom third. If you’re going have two names running across that you can’t expect every solver to know, you need to give them a chance with the downs. Instead, we have more trivia with POPE being the worst offender, imo, as the I’ve never seen Innocent used in a puzzle before. Moreover, PURE works both as an answer for “Innocent, perhaps” and seemingly across with its U and R. A simple clue change solves matters. Loved the Stumper as usual. The bottom third was my favorite part! None of those answers were gimmes for me, but like Huda I pulled them out of someplace. I don’t remember the painting, though. I agree that I could have used easier crossings, but I liked the wordplay with Innocent, in the end. For my part, I wasn’t too crazy about the top third, since I don’t like that type of clue (spoken phrases). They weren’t too bad for me, though. My downfall was ALATEEN crossing LETS. Since tennis is one of the few sports I know anything about, it’s too bad I missed that pun. I haven’t been able to open today’s Universal puzzle through the AcrossLite icon. Keep getting a “not found” message. Any suggestions? 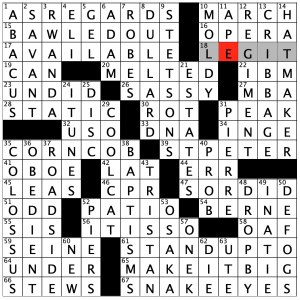 I’m not able to get the Universal crossword with the link. I haven’t tried for about 2 weeks because I’ve been abroad. Did I miss something? I was doing fine through yesterday. Today is the first time I’ve had the problem. Universal should be there now. I’m in Seattle for a family memorial service and a power outage messed things up. Of course we lose power when I’m out of town. I managed to get it limping again remotely. There may be some other glitches before I get home Monday. But my fingers are crossed. Thanks for the update, Martin! My best wishes to your family.